OK, kids, listen up. For today’s activity, let’s see how many dubious safety practices you can spot in the following photograph? I count about six — if you include the suicide levers. 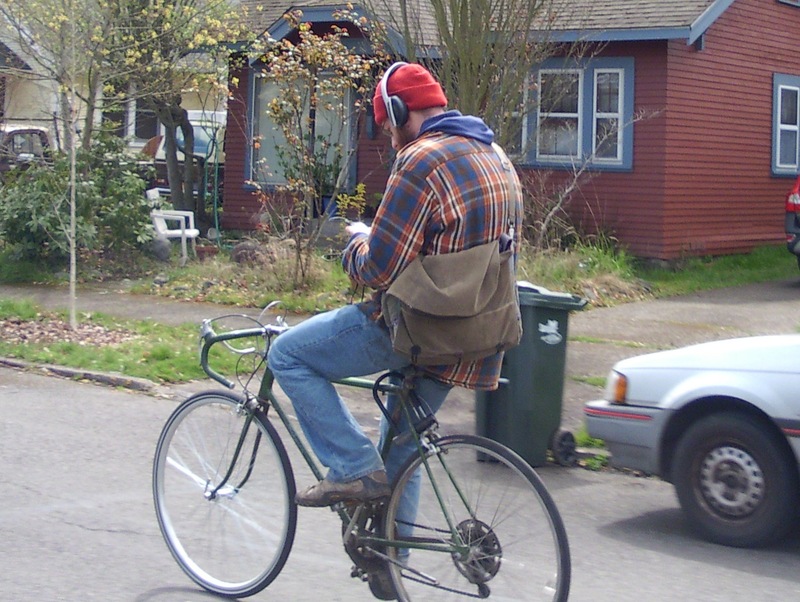 1) Hands off bars, 2) Viewing interactive device, not road, 3) Headphones, 4) Lock could affect pedaling, rear brake operation, 5) Without pants clip; snag hazard, 6) Weak kickstand spring; kickstand could interfere with pedaling, and 7) Flannel (though I’ve been guilty of this as well). I also wonder whether it really was garbage day and, if so, whether the car in the picture went to the landfill along with the contents of the garbage tote because of their proximity. Okay, I’d like to use this photo for my bike safety class! Please, by all means. Actually, I’ll send you the hi-res version. No rear reflector. No… gasp… helmet! No big flashing light… no bright orange or yellow jacket. Really, I felt like such a scold posting this. Ah, well. You know, I have asked EPD whether they interpret the new no-driving-while-phoning-or-texting law as applying to cyclists. I’ll let you know when I hear back. Right, what if he’s just tuning his ‘radio’… that’s legal…as are those headphones by the way (at least in Oregon). Another unsafe item might be the shifters. I can’t see them but I think they are the ones mounted on the stem (since I don’t see them on the down tube or bar ends). A sudden stop or dismount when they are shifted into a position pointed towards the rider- OUCH. On the bright side- Safe items: Good lane position (out of door zone it looks like), riding with traffic, red/visible headgear, no bag on the handlebar, real brakes (not fixie pseudo things), protective eye wear, quick release skewer in good position…. I also wonder if that bike is a Schwinn Varsity not originally designed for a front quick-release. If so, chances are pretty good that the axle extends beyond the outside face of one or both dropouts, increasing the possibility of the wheel, well, dropping out. And if it is a Schwinn Varsity and the rider has to lift it at the beginning or end of the journey, some might say that’s a massive safety problem right there. No one with a cargo bike, of course.